An organisation calling for direct flights held a protest outside Leinster House last week. 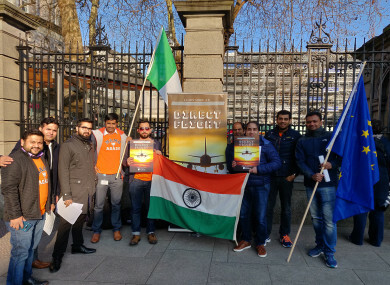 MEMBERS OF AN Indian diaspora group are lamenting the lack of a direct flight between Ireland and India. Over 45,000 Indians live in Ireland today with the number expected to continually grow over the coming years due to demand for skilled workers. The organisation held a peaceful demonstration outside Leinster House last week to call for change. Currently, no flight directly links the two countries with many Indian residents travelling to London to catch a flight back to their home country. Making the case for a direct flight, Shashank Chakerwarti (who is an Irish peace commissioner) said that a direct flight between the two countries would not only improve cultural relations between them but would also benefit both countries economically post Brexit. “A direct flight signifies the cultural, historical and economic ties between the two fast-growing economies, especially post-Brexit,” he told TheJournal.ie. Ireland will be the only English-speaking country in the EU, it will play a vital role in enhancing Indo-EU relations, as well as, Indo-US relations. However, Chakerwarti said he realised that such flights would not be possible from the get-go. Fine Gael Senator Neale Richmond has subsequently called on Minister for Transport, Shane Ross to consider the advantages of the flights, calling India a valuable resource to the country. So let’s get this happening, let’s get it going. A spokesperson for the department, however, confirmed its limited role in the process. “The Department of Transport, Tourism and Sport facilitates connectivity to/from Ireland through the negotiation of Air Services Agreements, ensuring the underlying traffic rights necessary to operate such flights are in place,” the spokesperson said. Aer Lingus and Air India have yet to respond to queries from TheJournal.ie. Email “Calls for direct flights between Ireland and India ”. Feedback on “Calls for direct flights between Ireland and India ”.